Events that seem like they should spell doom for stocks often don't. That's why it always pays to investigate history. If you don't, you'll likely get caught up in media fear. That's the case with the recent government shutdown. The common belief is that a government shutdown will hurt the economy... which should impact stock prices. Stocks have a history of soaring after government shutdowns end. We could actually see gains as high as 20% or more now that this shutdown is over. On Friday, the longest government shutdown in history came to an end. It totaled 35 days, nearly twice as long as the second-longest shutdown that happened under President Bill Clinton in the mid-1990s. This time, Democrats and Republicans are fighting over funding to increase security along the southern border with Mexico. President Donald Trump, seeking to fulfill one of his key campaign promises, wanted $5 billion to build a border wall. Democrats have said they'd support $1.6 billion for a border fence... But they refused to negotiate until the government was reopened. Now the shutdown has ended – temporarily. We have three weeks of the government functioning normally so that negotiations can resume. However, investors are afraid the shutdown could still hurt stock returns... And it's easy to see why. After all, according to a report by the Wall Street Journal, government spending was responsible for half the acceleration in economic growth since April 2017. The media has picked up on this fear, too. The talking heads on television continue to push the idea that the shutdown will hurt the economy... and therefore, the stock market. Yet, when I looked back at the market reaction to past shutdowns, that wasn't the case. In three out of the four instances before this one, stocks rose during government shutdowns. And this time around, the market is up big... rising 10% in a little more than a month. This raises the question – now that the shutdown is over (for now), what should we expect stocks to do next? As you can see, the end of each shutdown was followed by powerful returns. The average return a year later was 19%. And in each case, stocks basically went straight up after the shutdown ended. Of course, this is a small sample size. But the kneejerk reaction that the government shutdown should be bad for the markets is dead wrong. The government is now back open for three weeks. That's not much time to negotiate. If the two sides can't reach an agreement on border security, we could see another shutdown soon. But while D.C. is notoriously slow under normal circumstances, when properly motivated, it can move with stunning speed... And even if another shutdown does happen, history suggests the stock market will get along just fine. In short, the conventional wisdom about government shutdowns and the stock market is wrong. Now that the government is back to work, it's a great sign for stocks in 2019. Editor's note: Scott and his team of analysts at Stansberry NewsWire use their expertise to reveal what's happening behind-the-scenes on Wall Street, so you can profit on Main Street. If you want to feel more "plugged in" to the markets, look no further... This service delivers up-to-the-minute news and market research, expert commentary, and trading ideas – absolutely free. Click here to sign up now. "Watching real dollars is the most valuable way to learn what investors believe," Brett Eversole writes. Learn more about a rare event – and what this could mean for stocks in 2019 – right here. "I don't do this often," Steve says. "The last time I made a major commitment to stocks like this was back in late 2008." Read more about why he's investing so confidently today here: What I'm Doing With My Own Money Right Now. PayPal (PYPL) is a $108 billion digital-payments giant. This company helps businesses and consumers make online payments quickly and securely. 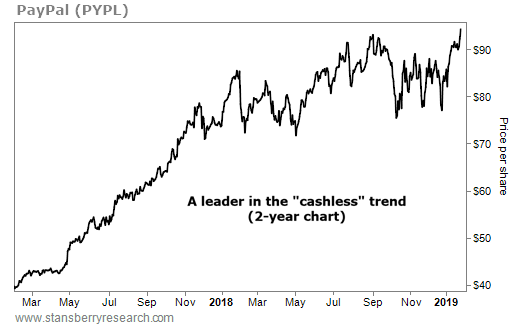 PayPal has steadily won leadership in the space by snapping up other companies in mobile payments and financial technology… To give just one example, it took ownership of the popular Venmo payments app in 2013. Now, the platform is becoming a powerful asset for PayPal… In the third quarter, Venmo processed $17 billion in payments, up 78% from the same quarter in 2017.